Access to restricted locations in your facility can pose a serious risk to safety of people and property. 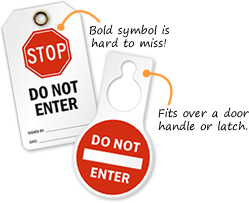 Restrict entry to hazardous locations in your facility with Do Not Enter Tags. Tags identify temporary hazards and keep everyone out of harm’s way. • Durable plastic tags withstand tearing, water and chemical spills, and offer good pull strength. • Choose from tags with no eyelet, metal eyelet, and pull-proof grommet. • Get unbeatable prices on bulk purchase!